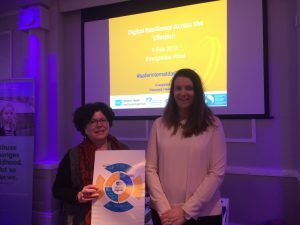 On the 6th February 2018 Mairead and Mary from Early Years- the organisation for young children attended a conference on Safer Internet Day. The Topic: Digital Resilience across the Life Span. Of particular relevance to us and the Children participating in the WYRED Project was building digital resilience in children and young people. From our work with children and young people so far on the WYRED project, online safety and Cyber bullying are real areas of interest and concern. Building children’s and Young peoples online resilience so that they increase their confidence and capacities as well as knowing what to do should something go wrong is key to ensuring that children and young people are safe and as resilient as possible in using the online line world, which is now part of our every day life.